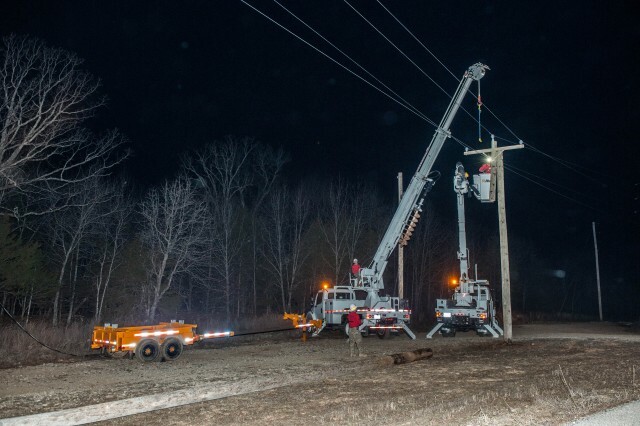 No matter what part of the country you live in, one is faced with the harsh reality that a storm could come through any time of the year, causing power outages -- outages that require a unique skill set and the meticulous training of linemen to repair. Fort Leonard Wood is the home of the Army's Prime Power School which teaches the Power Line Distribution Course, commonly referred to as U4. Before service members can pass the course, they must first prove they've learned the skills to do their job safely and under stressful conditions by enduring "Storm Night." "There's a lot of responsibility that comes with what we do," said Sgt. 1st Class Brandon Ecker, PLDC instructor/writer, as he pointed out the various areas damaged and entangled with debris from a simulated storm. The "storm" comes as the finale to the culminating event where students spend a week building an entire distribution system, with the exception of setting the utility poles. Ecker said once the students complete the system that final morning they are briefed and sent home. "Early this morning we gave them a WARNO from the state of Missouri stating that the governor needs help and FEMA is going to activate the U4 students," Ecker said. "They're going to be on call and need to be prepared to come in." Ecker said once the students leave, the instructors head out and start causing "storm destruction" before recalling them to assess the damage as daylight fades into night. Typical damage one would expect to see following a tornado can still clearly be seen with the help of lights provided by work trucks: a broken power pole, brush and debris caught up in the lines, snapped lines and even a piece of metal twisted and woven between power lines. "Usually there are some small things we do that they may or may not see, and from the ground there are some things you cannot see," Ecker said. "We try to make it so when they're up there working on one thing they will notice something else that's wrong." Sgt. Kenneth Swadley, PLDC student, said the teams did well playing on everyone's strengths during the exercise but admits it was challenging. "I was not quite sure what to expect during this training exercise," he said. "We had all conjured up many different scenarios of what kind of damage and problems the simulated storm damage could take, but the magnitude of some of the damage was a bit of a shock." 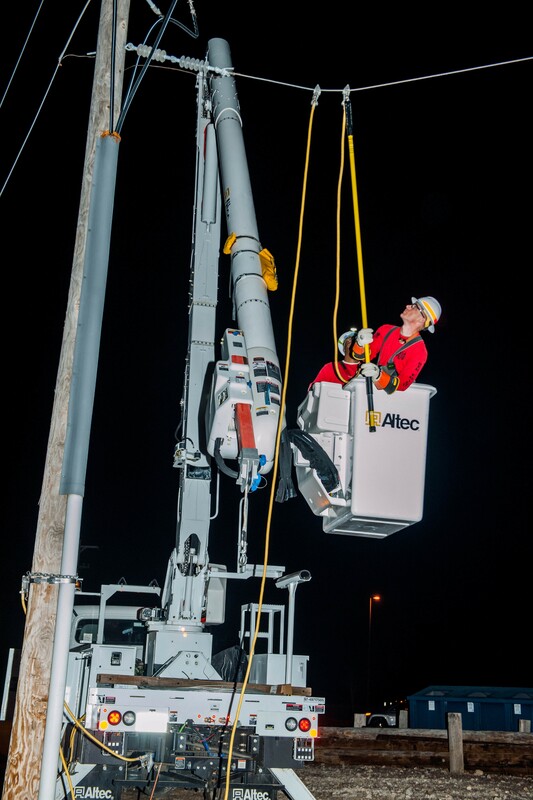 Swadley added, "having this training at night definitely added to the realism of the exercise, as electrical problems will not always occur during business hours. The additional stress of being tired and the darkness affecting everyone's visual acuity made it all that more important for everyone to work together and to overcome the obstacles the storm caused." Ecker said students either come to Prime Power as specialists or as new sergeants, so leadership qualities are one of the most important things they look for during the exercise, and students are graded accordingly. Students are rotated through leadership positions throughout the week for evaluation. "It's very realistic training," Ecker said. 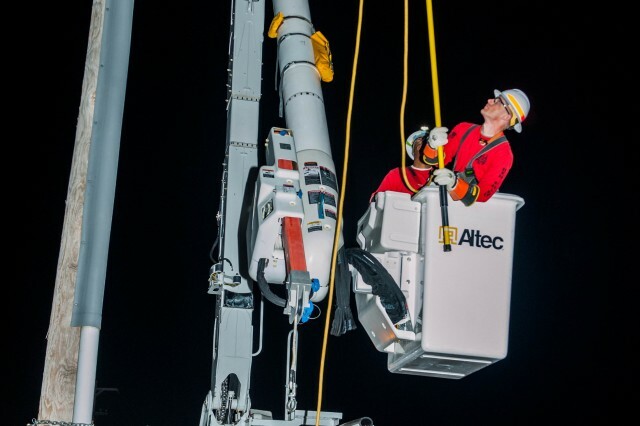 "Storms come through at all hours during the day, during the night, so we feel we need to make it more realistic. If there's people without power, someone has to go out and repair it."